A wartime diary entry mentioning a couple of lads of my acquaintance. H- has the best beach for about 100 miles in any direction, and is directly opposite Ireland. H-is full of evacuated children from Merseyside, Liverpool University students doing theses, various foreign refugees, and others who have skipped from danger areas, like London. The greens on the [golf] course were in good condition. Local regulations about showing lights are not very strict. This despite the fact that the German Bomber Command aircraft always go up Cardigan Bay to attack Liverpool, and thus get a “fix” on the naked lights visible in various parts of Merioneth, including H-. H- has had no bombs nor sirens. Found four evacuee kids at Erinfa—Leslie the blonde, Norman the brunette, David the red-head, and Edwin just mouse colour. 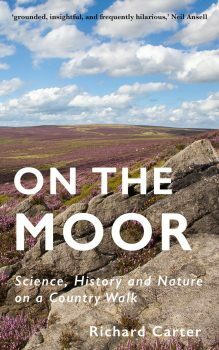 As a test of observation for them I hid eight pennies, three sixpences and a shilling round the terrace of the house. Leslie the blonde found practically all of them. Played penny bridge, and went to bed to the hoot of the owls. Thank goodness there are none of that much over-praised bird the nightingale round here. the brunette evacuee, Norman, is my dad (then aged 6). I managed to track down a second-hand copy of Off the Record a few months back, and, yesterday, left it as a surprise Christmas present at my dad's. By a strange coincidence, unaware of the present, Dad was reminiscing about his days as an evacuee over whisky on Sunday evening. He is planning to pump his older brother for more reminiscences over Christmas lunch at my sister's place this afternoon. 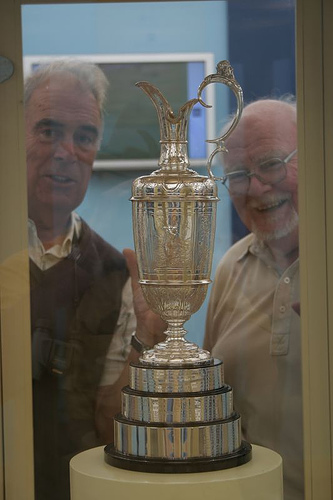 Norman (L) and Les (R), inspecting the Open Golf Championship claret jug in 2006. This article was cross-posted from my Gruts website.